HEREFORDSHIRE'S LEADING MOBILE VALETING SERVICE, REMEMBER, WE COME TO YOU! longest established and best known fully mobile car valeting service. outstandingly clean car with each and every visit! tools available on the market today. We source the best valeting, detailing and cleaning products from around the world to get the best results time and time again! and our services are second to none! We aim to maintain the highest standards to all our customers, old and new. Being a completely mobile service, we are able to travel anywhere in the county, and into our neighbouring counties to provide the very best in valeting and detailing service. To achieve that, Glyn's Car Valet Service makes use of our specially modified Mercedes Vito van, which is fully equipped with everything needed for the services we provide, all we need is a power point and away we go! At Glyn’s Car Valet Service we guarantee that your car will experience the very best valet it’s ever had! We are not a franchise, but an independent business, so we have total control over the equipment and materials we use, to help ensure we deliver the very best service you will find anywhere. Our valeters are AutoSmart certified, this ensures that the level of technical competence and service quality is second to none. Our team are trustworthy, friendly, courteous and highly presentable - something that we believe is essential in delivering the overall service package to our clients. 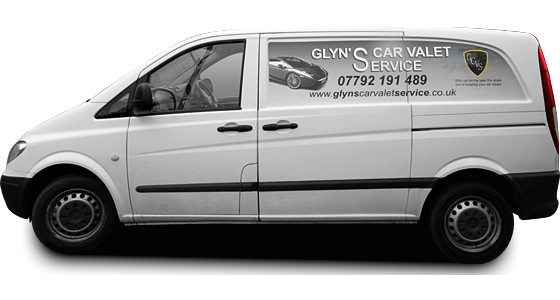 Glyn's Car Valet Service, is a completely mobile service. We are able to valet your vehicle anywhere which is convenient to you. 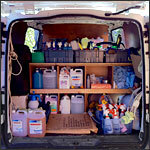 We at GCVS can truly say, that we offer a 100% mobile service, thanks to our modified Mercedes Vito van. We bring everything we need to get the job done! Passionate about cars? We are! Your car is in great hands with GCVS as we treat every car as if it was our own. We realise that when we valet your car, you are placing a lot of trust in ourselves to make sure that the work is carried out to the best possible standards and in a manner which is of minimal risk to what is for most people, the second most expensive investment you will make. We do all we can to honour that trust and take every precaution to make sure that the condition of your car only improves after a valet by GCVS! Whether your car is brand new, or 80 years old, from Fiat or Ferrari you can be sure we will give your car our full attention! We are based in the village of Bodenham in Herefordshire, however as we are a mobile setup we are able to reach any location within the county. 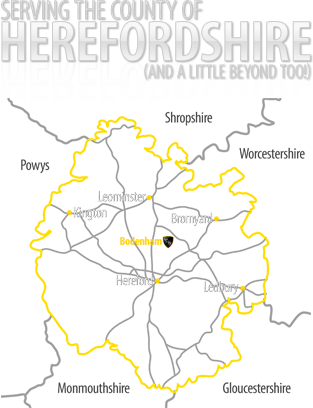 We don’t simply stop there, if you live close to the border of Herefordshire in any of the surrounding counties we will still be able to reach you! We might have to charge a little extra for fuel if you’re within neighbouring counties but if you would like your car to be professionally valeted by GCVS, please feel free to give us a call to see if we can reach you on 07792 191489.